Perfect Accessory for Airfryer -If you own a Philips Airfryer or Power AirFryer, Farberware airfryer or other airfryers, This is a perfect accessory to complement your cooking! The double layer rack allows you prepare a greater amount of food maximising the space for your airfryer. You can use it to bake, grill chicken wings, fish fillets, hash browns, onion rings and more. The rack comes with four steel skewers for making meat or vegetable kabobs. 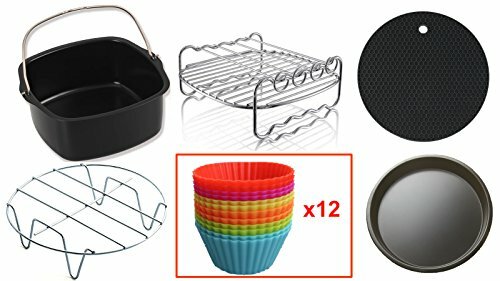 The baking dish allows you to bake cake, bread, quiche and more, in a quick, easy and very healthy way. The air fryer muffin cups are made exclusively baking muffins and cup cakes in air fryers. Removing the muffins or cupcakes from the air fryer cups are easy due to the flexible material. Made from food grade silicone and you can reuse over and over again! Heat Resistant up to 425F. Use the metal stand to double the space for cooking in the air fryer, place your food in the first level and use the metal stand to place the second layer of food! All accessories are dishwasher safe and easy to clean! Buy now to enjoy the special offer!